At BlizzCon, we were given the chance to sit down and chat with Tim Morten and David Kim about a whole host of changes announced for Starcraft II heading into 2017, from the War Chest, to esports integration within the game, to the wide-ranging balance tweaks coming in the next season. TeamLiquid.net: On behalf of TeamLiquid.net, thanks for giving us the opportunity to talk with you. If we could start with you, Tim—even though you’re the head of the production team, you’re not seen as the face of the Starcraft team unlike someone like David. Could you explain to people who might not know you too well what your role is within the company? Tim Morten: Sure. It’s a very collaborative team, so I don’t think any of us tend to think of ourselves as the head, but my role involves coordination of the development work that goes on, planning and prioritisation of what’s coming up, but also being the advocate for the product inside and outside the company in coordination with the other departments. Esports, marketing and community; all these various pieces that support Starcraft II and enable it to be as successful as it has been. Also, at outside events like this, I get the chance to share my excitement for Starcraft with the rest of the world. If we can move to the announcements that you’ve made over the weekend then; esports microtransactions are a feature that the community’s been after for quite a while, but in the past, you’ve said that it’s not a path you wanted to go down. What changed your mind when you decided to bring in the War Chest? Tim Morten: Speaking from my side, this is one of those ideas that has percolated for a long time. We’’ve really been committed to trying to respond to the feedback from players, and hopefully you guys will see this as well. Players have sent a clear message that this is something that they’re interested in seeing; we want to be supportive of that, and of course we are excited about the potential of this to really grow Starcraft II esports. David Kim: And as for skins, I think we’ve said before that we wanted to do it, but performance issues made it so that we can’t do it, but our engineering team has solved those issues. The Collection has now brought in new sprays and skins, so is there a chance that there’ll be some team or individual logos that can be brought in? Tim Morten: No specific plans on that yet, but that’s the kind of thing where as we get that feedback, we can consider moving in that direction. Are you happy with the reception to the Collection so far? Tim Morten: Yeah, definitely. We feel like this is just the beginning for us, and with the War Chest feature, there will be a lot more content that plays into the Collection, so this lays the foundation upon which we can build the future. Have you looked at having something like the Steam Community Workshop, which they use in CS:GO, where perhaps some community creations can eventually be incorporated into the game? Tim Morten: We’re open to that feedback, if there’s interest from players. I think that one of the things we have always tried to be very careful about is maintaining performance and the quality of what’s in the game. There may still be ways to accomplish that with 3rd party content coming in. Obviously through Starcraft Arcade, we have a sandbox for that kind of content, so those are ideas that will be considered in the future. Moving onto balance for now then, David, what’s your major goal for all three races going forwards? David Kim: So we ultimately want the game to be in a place where every race is strategically diverse and fun, both to play and to watch. We analysed the game throughout the year, and thought that we weren’t quite there yet. We almost never see mech play in LotV—that’s something we obviously wanted to address—and SkyToss is another thing that’s going to be changing—we’re changing three stargate units. That’s our ultimate goal, and hopefully this major patch pushes us towards that. A lot of the changes are pushing mech forwards, but some are also reducing the impact of bio. For example, the baneling change in particular is going to have a large effect on bio TvZ. Are you worried about the pendulum flipping in the opposite direction? David Kim: Right now, the thought was that if you do the micro against the banelings, then it’s not a huge change. So we wanted to push this side of it, because that’s where we believe bio stands out, so we wanted to amplify that. On the mech side, we wanted more of the opposite; we wanted more of a positional game, a slower paced game where you defend at multiple locations. It’s about “How am I spreading out my siege tanks so that I can defend correctly across all these fronts?”. So we wanted that clear distinction. The specific numbers can be tuned if they’re too problematic, because the ultimate goal is that we want them both to be seen, rather than just mech. On that note then, how do you go about finding a compromise between balance and game design, and would you ever compromise on one to achieve the other? For example, bio vs muta ling bane has been one of the most loved matchups throughout SC2, but at some points it’s been in favour of the terran and at others in favour of the zerg. David Kim: We try to tweak the balance so that we get to a better end goal, but it’s not totally up to us—it also depends on how the metagame is, how the pro players find their solutions. We see it that we’re not really trying to control how everything goes; we’re trying to make the best guesses like “If we change this thing, then can we start seeing more of this thing?”. I think a good example of this is that we’ve always that warp prisms weren’t too strong; a long time ago before they were buffed in HotS. No one was using them, so we said, “What if we do a health buff?”. It shouldn’t matter too much in terms of effectiveness because back then it wasn’t the case that not being able to survive one extra shot from a unit was why it wasn’t used. But after seeing that buff, players started using it and started seeing how strong it is. But sometimes it goes the other way too. We have an intention behind a change, but how it plays out is totally different to what we expected. This is actually really good, so while we didn’t expect that, we think it’s OK, it’s a cool thing to add to the game. So I think it’s a very back and forth relationship between how the players play and how we try and tune it. It’s never a 100% thing where we buff a unit by a certain amount to get this exact change; it never happens that way. This year, we’ve seen with the region lock that very different metagames have developed in Korea compared to the rest of the world; for example, zergs thriving in Europe while struggling in Korea. Has that made your job much harder? David Kim: I think that this year for our team has been much harder than before, because there are two different areas to balance for. With that said, I don’t think it’s that bad, because there’s a lot of excitement that comes from that too. For example, no one expected three non-Koreans to get to the quarterfinals this BlizzCon—almost half—which is kind of crazy, right? But we think that a lot of that is that each side has developed their own metas because of the region lock, so they don’t know exactly how that’s going to turn out. I think that it’s the skill plus this aspect of it which is very cool. So I think that the region lock was good, but at the same time, like you said, it’s much harder. If we can move back to the announcements then from this weekend, another main aspect of Starcraft that’s been brought in over the past year is the Co-op. In the last three months, you’ve released one Co-op commander per month, which is a huge increase on before. Is this representative of what we can expect going forwards? Tim Morten: We’re definitely going to continue producing commanders. There’s a lot of variability in how long it takes to create each commander, both because of differences in the art and design of commanders, but also because when we have an idea, we may need to iterate a lot, or we may find that the original idea was great, and just go with that. So I don’t think there’s any way we’ll be able to keep up with one a month like that, it was just a lucky run of circumstances towards the end of the year. But we will absolutely continue producing commanders next year. One thing teased in the announcements was the idea of a new Watch tab in-game. Can you talk a bit more about how that will function? Tim Morten: We’re working towards a future where video content can be consumed directly within the Starcraft 2 client. We’re not at a point yet where we can predict when that’s going to land next year, but we are working towards being able to host esports video content within the client. So is that going to be a direct video feed, or would you possibly be able to observe within the game itself? Tim Morten: What we’re envisioning for now is a video feed. I think that observing on a broad scale, where we are connecting potentially hundreds of thousands of players to a game has a lot of implications in terms of performance, bandwidth, the potential for those observers to disrupt the game, which we absolutely do not want to happen. So video is what we’re focussed on for now. You also teased new custom tournaments within the game. What kind of customisation can we expect; are we limited to the current single elimination format or can we reproduce a GSL-style league? Tim Morten: We’re trying to make this as flexible as possible. We’re still working through the design of it as there are so many different possible scenarios. We do want to make it very flexible, but how many of those scenarios we’re able to accomplish is still an open question. We were watching the Deepmind presentation this morning, which was incredibly interesting. Did they give any indication of how long it would take before Deepmind is capable of taking on human opposition? Tim Morten: There is such a wide range of guesses for that, and all we can do right now is guess. Some people are very optimistic, and think that it could happen faster than anyone expected. I personally think that it’ll take a long time, because Starcraft II is so complicated. And as you guys saw at the panel, things like planning, memory, imagination; these are problems which haven’t been tackled previously that will have to be tackled for Deepmind’s Starcraft II AI to be successful. They are very smart people, and they may tackle those this year, but personally I think that those big problems are going to take some time. In the meantime though, by opening up Starcraft II as an AI research platform, we fully expect that it won’t just be the Google Deepmind team, but that other teams will get involved. I think that even if it’s not ready to take on humans quickly, just seeing those AIs playing each other, as we’ve seen in Brood War with some of those academic competitions, could be fascinating to watch. I’m so excited about this new initiative, about the API release; I think that it’s going to be a focal point for innovation in Starcraft II. David Kim: I was going to ask you guys what you thought was the coolest point about the panel? I’ve been in interviews, so I haven’t been able to check it out yet. TL:The thing I latched onto most was that he brought up the potential for using Deepmind to develop the in-game Starcraft II AI, and also in particular develop some coaching mechanic in-game, so it could help newer players learn on the fly. Tim Morten: To expand on that, one of the things that the AlphaGo AI did was predict what the most likely next move was, because it’s got all of that historical data and replays. One of the biggest problems that new players coming into Starcraft multiplayer have is knowing what they should do next. They’ll look at build order trainers, or various tools that are out there to get better, but imagine having something in-game to give you suggestions that aren’t even just the suggestions that one particular player might think is the right idea to do, but that have come out of millions of Starcraft replays. That could be really powerful. We don’t know how that’s going to manifest, but the potential here is exciting. 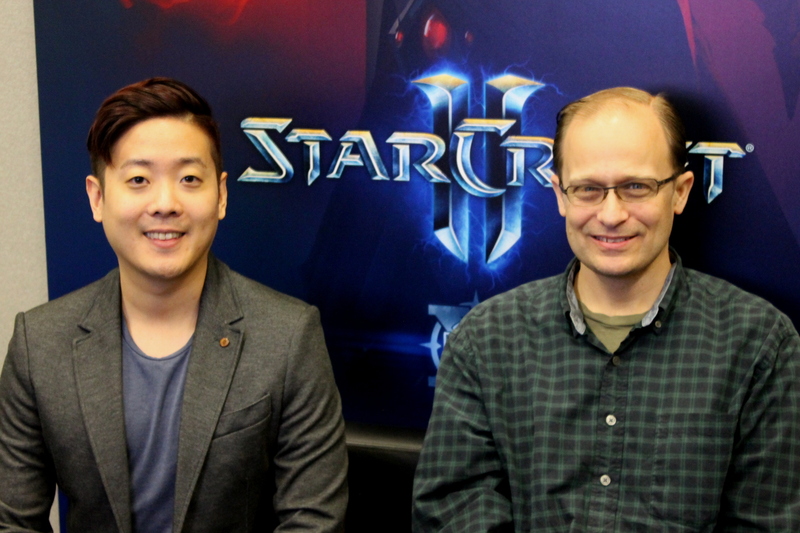 David Kim:That part is the core of what the fun of Starcraft II is. Getting better at different parts of it, and feeling that sense of accomplishment. TL:Well, with enough mechanical skill, anyone can replicate a build order. It’s the decisions in-game and all the messy choices that you have to make that are most interesting. David Kim:What I was curious about is whether the AI is allowed to do anything? If it is, then it’s impossible for humans to win. TL:They actually addressed that. They said that first of all, they were going to limit the APM of the AI, and secondly, they were going to make it as close to humans as possible. As in, they’ll have to be looking at something in order to move it, and they’ll imitate how fast humans can switch screens. I had that question too, because you see all these tool assisted scenarios where you’ll have 100 zerglings splitting against 95 widow mines. David Kim:Or if you have marine drops at five different places, with perfect micro on each individual marine. Then obviously humans can’t win! Final question on the announcements then. Something that wasn’t brought up yesterday, but which has been rumoured for a while now is Brood War HD. Do you have any comments on that? Tim Morten: No Brood War HD to announce! We obviously are fans of Starcraft I and Starcraft II; we love that people are excited about Brood War still, but as a team we are focussed on advancing Starcraft II, the War Chest, co-op, all the multiplayer changes that Davey’s talking about. We really appreciate the excitement, but we don’t have anything to announce there. Well, I hope you understand that we had to try! Moving back to balance then, did you watch SHOUTcraft yesterday? What did you think? David Kim: Yeah, I watched all the games apart from the first one, uThermal vs Hydra. It looked like the players aren’t used to the changes yet, as you guys probably thought as well, but the potential I think is there. For example, right when I started watching the second game, the casters said that nothing new was used, maybe the pros think that the new stuff isn’t that great. As they were saying that, INnoVation went for mass cyclone! Then, right when they were saying that mass cyclone couldn’t be beaten, the hydras start beating them and Hydra won there. But I was thinking there that if INnoVation had a couple of the new siege tanks, which do so much damage against hydras, it would have been different. So I think that the potential is definitely there, so we’re excited about the patch going live. We’re also excited and a bit scared about whether some gamebreaking strategies will come out for tournaments this year—there’s a Homestory Cup soon. So there’s a higher chance than normal that there might be some unbeatable thing that comes out, and the whole tournament is a little bit off, but I think that the atmosphere of the tournament is a bit more casual so I think it’s OK. But it could happen, so we’re going to keep a close eye on it and react quickly if that happens. TL:So you really are releasing soon then, because Homestory’s in a couple weeks time? David Kim:Yeah, we want to try and release it in the next couple of weeks. So were you watching those games in the arena, or on a different screen? David Kim: I was watching it in a different place, but a lot of the team were in the actual arena. OK, because the reason I asked is that when the zerglings surrounded the cyclones, I think everyone in the arena thought that the cyclones were dead, and the arena gave a collective ‘whoa’. Everyone started laughing when the zerglings did nothing. And it was funny that the tank buff was such a crucial part of the mech buff, but INnoVation never bothered to go for them. David Kim: Hydras are very strong, and that is something that we’re working on. We’re wondering if the timing when the upgrade finishes and they reach their full strength is a little too quick, but we can work on those details. It seems that quite a lot of the changes are very decisive going forwards, doing a whole batch at once. But in the past, it’s been more of an iterative process. Why the change? David Kim: I think that you’re right about the balance patches, but with this one, we kind of thought of it as a multiplayer-only expansion, so if you compare it to the previous expansions and the number of changes that go in there, I think it’s more comparable. For us, we wanted to squeeze in as many changes as we can, so that we can really make the game be in a much better spot, and I think that this timing right before the next season starts is a really good time to test everything out. Worst case scenario is if there need to be big changes in the next couple of months, or some reverts, and then we’ll go forward next year. Do you see this as an annual process then? David Kim: The answer to that really depends on how next year goes. We’ll do the same exercise I think, evaluating how the state of the game is. Our ultimate goal is that we won’t have to make major changes, only balance tuning changes, but still the strategic diversity is really good in the game. So say we’re 95% there after these changes go in, then obviously there won’t be a major patch next year, but if we’re halfway there, then maybe we do. It really depends. Throughout Starcraft II, there’s been more and more abilities added to units. Are you worried about the game becoming too complex? David Kim: That’s definitely something we hear, and we wanted to make sure that it’s not too overwhelming with this major patch. So if you look at the full list of changes, we were very conscious about not adding active abilities. If you count, I think that there are two new active abilities that were added, and one was removed, so we only have one active ability more than before. The majority of the changes going in are all numerical changes; for example the hydralisk change is just a speed change and a range change, but it’s pretty huge in terms of the hydra’s ability to be a core unit. We tried to do as many of those as possible, because we were conscious of and agree with that feedback. As far as I’m aware, these balance changes are the same as those announced back in August. Is there anything new that’s going to be a surprise? David Kim: The only thing that’s not currently in the test map right now is a change to the ultralisk armour. We want to add one to the base, and subtract two from the upgrade so that it’s not so all or nothing, plus the overall strength is a bit nerfed. We also want to take a look at the hydralisk changes that we just talked about, the timing of reaching full strength. Maybe we need to split the range and speed upgrades again so the range upgrade gives +2 from the base, and the speed upgrade functions as it does currently. The other thing is that we get a lot of feedback saying that the cyclone’s ground attack is too much, and that the anti-air is too weak. We’d like to take a pass at making sure those are in a better state before release, plus if we find anything next week in JYP’s King of the Hill tournament with pros in the test map. I’m personally hoping that there are some broken things that get found before we go live, some all-ins that have to be fixed. I wanted to ask about maps; you teased that next year, you’ll allow map makers to play around with different map features like mineral patches / gas geysers for the first time. Can you tell us about your thought process for this, as in the past you’ve always been very strict about sticking to the default setup. David Kim: I think up until now, we’ve thought that we have to be strict and not go too crazy with map ideas, because there aren’t a lot of good tools for new players coming to the game; we don’t want them to be too overwhelmed. But now, it feels like we’re not 100% there yet, but places like TeamLiquid, like Reddit, there are posts that come up trying to help new players whenever they ask questions. Plus we have the co-op mode, where we have broken a lot of these rules, and we’ve noticed that new players coming in aren’t too affected or confused by that. All these factors added up I think, and now we want to make a push for greater map diversity that we haven’t seen before. I think the next step is what the community has been requesting for a long time. Finally, just to wrap things up, who do you think is going to win WCS? David Kim: I was hoping that one of the three ‘better’ players would win, but now there’s only one ‘better’ player remaining, and by better I mean higher skilled. So I’m hoping that Elazer wins! That’s happening right now, isn’t it? I don’t know the score, but I hope that he can do it. If not, then I’m hoping for a Dark-ByuN finals, with hopefully ByuN winning. Tim Morten: Like Davey, I think it would be so exciting to see one of the non-Koreans go all the way. But I am a ByuN fan, so I’m very excited to see that too. David Kim: His story is just so awesome! Although, what’s funny is that yesterday I was downstairs in the caster / pro player waiting area, and I asked them who was going to win, and they all said that TY was going to win [against ByuN], and that it would be a TY vs Dark finals, and TY would win. So I asked, “So no one thinks ByuN can beat TY?”. Pretty much everyone thought TY was going to win. TL: Yep, we all thought TY here too. David Kim: I really wanted TY, but it was a good series. Thanks very much for your time. Is there anything you want to say to wrap up? Tim Morten: Thanks to you guys for all the support of Starcraft II, and all the passion around the game, we really appreciate it. He called the blizzcon finals! Nothing too insightful in his answers imho. He really tried not to give away anything and stayed as PR as possible. Typical DK interview. Separating the hydra buff into attack range and move speed upgrades sounds like a step backwards. Well the patch will hit after HSC now and I think that's good. But at IEM and WESG players will have had some time, I expect to see some crazy games there! "The other thing is that we get a lot of feedback saying that the cyclone’s ground attack is too much, and that the anti-air is too weak. We’d like to take a pass at making sure those are in a better state before release, plus if we find anything next week in JYP’s King of the Hill tournament with pros in the test map. I’m personally hoping that there are some broken things that get found before we go live, some all-ins that have to be fixed." So David spewing more of the same corporate BS he has for years. Not sure why I expected anything else from him at this point. Instead of making mech viable, why not make it fun first? I find it strange how all this talk is like "Oh what can we do to make X viable" completely ignoring that viability is not even the biggest issue. It's that whenever mech was viable, people raged hard because it's just frustrating to watch and play against. Or am I that "misguided"? What am I missing? Last time mech was viable it was during the big swarm host era in HotS, and it made me quit the game. I only came back because LotV changed that. I get that strategic diversity is important. I think David Kim is completely right in many of these points. But I don't agree with making a strategy viable "just because". There must be more solutions other than "balls to the wall MMM + Tank" and "turtling mech". Maybe I'm overthinking this. Maybe it's because I'm rusty - but playing on the test ladder so far mech has just been as frustrating ever. Terrans massing ravens & turrets along with thors and tanks, resulting in the same old stalemate games as ever. Just boring. I'd rather face multi-pronged drops all day. They ended up scheduling the patch after Homestory Cup. I'm not sure what to read into that. Basically HSC would be decided by what shakes up the current meta the most. Having HSC on the current patch will ensure best player wins it imho. Certainly especially since the players wouldn't have time to prepare for the new meta, but that isn't something that has changed since the interview. Thank you. That was a good interview. I'm not gonna be too pessimistic over it but that seems to be Blizzards mantra now. "We don't have the technology"
"to replicate what our competitors did years ago". You're not off base at all. If you read between the lines or even just read the lines themselves you'll see peoples big feedback is the game just isn't fun in a lot of ways. Changing the cooldown on X isn't going to fix anything if X makes the game unenjoyable. I completely agree. I have had a lot of fun in LotV as a terran but honestly I think these new changes will make me quit the game -.- I never even understood why mech even had to be a thing in this game. Turtle mech (and mech in general) in TvT is the most boring thing to watch or play against. The new changes are almost all a step in the wrong direction. We shall see if the game is enjoyable at all after this patch but I seriously doubt it. Cool interview.Really excited for 2017, although I'm kinda sad there's not going to be any single player content for the next year, hopefully they'll keep me busy with Co-Op stuff. Rumors stay rumors, business as usual. Thanks for the interview. I'm looking forward to the greater map diversity. There's a lot to be explored in the map department. Also, I really hope the new balance changes are going to change the game for the better. They said it themselves, "we buff a unit by a certain amount to get this exact change; it never happens that way", there is no telling how it goes. what's that war chest thingy? We call it the “War Chest.” It’s a virtual treasure map that you’ll have the option to purchase, allowing you to earn new in-game content by playing your favorite StarCraft II game modes. It is very similar to the compendium from Dota 2. You pay money to get it, and part of the proceeds contributes towards tournament prize pools. You get some cosmetics and an in-client comic just from buying it, and there is also an experience system where you can get even more cosmetics by leveling up your War Chest through playing ladder, vs ai, or co-op. The cosmetics include at least skins and decals, and they are looking into implementing UI skins too.